We will always work within your time frame and budget. Below are some of the services we provide, however if your staging needs vary, we will provide a customized plan just for you! Please don't hesitate to email or call! Are you an HGTV fan? Love crafting and DIY projects? Well, yes or no, a home staging consultation is the perfect place to start! It typically consists of a 1 1/2 - 2 hr. in home meeting with your Stage Right Staging Professional (SRSP). Together, you & your SRSP will tour your house with the eyes of a buyer. You'll get tips & recommendations to transform your home into a showcase for sale. When your consultation is finished, you can use the DIY home staging plan you've made to implement it as you choose. If you're not the crafty-kind, fear not! We have a full-time, all certified team eager to help you on your road to home selling success! Whether to live in your home or getting ready to sell, we have Stage Right Home Staging Professionals that are certified Color Pros. They've received specialized training in color coordination (helping colors "play well" together) for living, and will show you how you can properly coordinate your existing colors, so painting for sale (if needed) is kept to a minimum. Know what the 60/30/10 rule is? We do! And we can show you how it's done! When your home is already furnished but you just need "a little something" to make it shine, the Dazzle package is your answer! After your home staging consultation, you and your SRSP will determine your home's unique staging needs and will create a proposal to fit them. Fees for this service varies based on what's being used. Dazzle Enhancement Staging proposal provided. According to the NAR Profile on Home Staging, furnished/staged homes show better and sell faster than houses that are shown vacant. Our Vacant Staging packages include everything necessary to show buyers your house as their home. Using our extensive home staging education and experience, we determine the best staging strategy to make furnishings, wall art and decorative accessories selections from our extensive staging collection that will attract the greatest number of potential buyers to your home - bringing it better offers, faster. Packages are customized to your home's buying audience, size, needs and your requests. Vacant Staging Proposal provided. When your staging needs are unique, we will create a plan to meet those needs. Please contact us via email or phone to let us know your needs and together we can determine how we can help you meet those needs and achieve your goal! Live out of town and want to sell? Are you an investor who needs someone to over see projects? Short on time and don't know where to start? Here's where we'll step in and remove the stress.... After an initial consultation, we can "pull the trigger" on any projects you need completed to get your home ready for sale! Our network of trusted home service providers include Realtors, painters, electricians, plumbers, handymen, detail home cleaners, window cleaners, carpet cleaners, movers and more... We will make appointments, get estimates and, once we receive your approval, we coordinate the schedules, oversee workers and get the job done! So, Stage Right helped to get your home sold quickly and now it's time to move! We can help you with that, too! There will always be a certain level of stress in moving and Stage Right wants to help lessen that for you. We can help with packing, sorting, moving items to storage or even to donation. 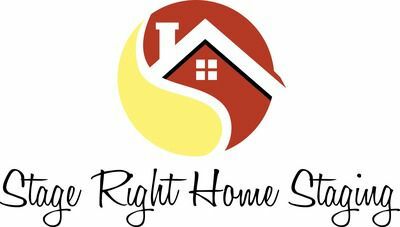 Stage Right partners with Habitat for Humanity, where more of your donation dollars go directly to the charity and help the needy right in your home state!